October’s final weekend provided a reminder of why many of us have chosen to live in West Marin. With sunny skies Saturday and Sunday, temperatures were comfortable even along the Pacific and Tomales Bay. On Monday, the weather turned chilly, and fog still blanketed the coast on Tuesday and Wednesday. With Standard Time scheduled to begin Sunday and the shortest day of the year only six weeks off, the season of darkness will soon be upon us. 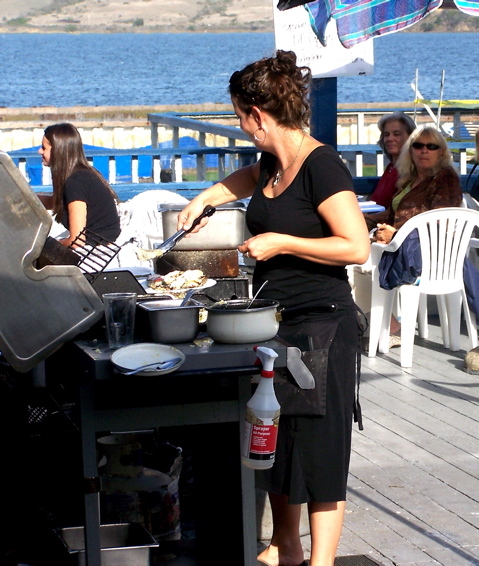 Barbecuing oysters beside Tomales Bay in Inverness — Molly Milner, who operates an oyster bar on the deck at Barnaby’s restaurant, held an end-of-the-season party Saturday, with oysters at half price. I alone ate a dozen. A folk-rock band entertained diners, some of whom were surprised when the bandleader urged them to join a heretofore-unheard-of cause: saving aberrant red variations of (normally black) Frisian horses in Europe. It seemed to be a weekend for eating throughout West Marin. 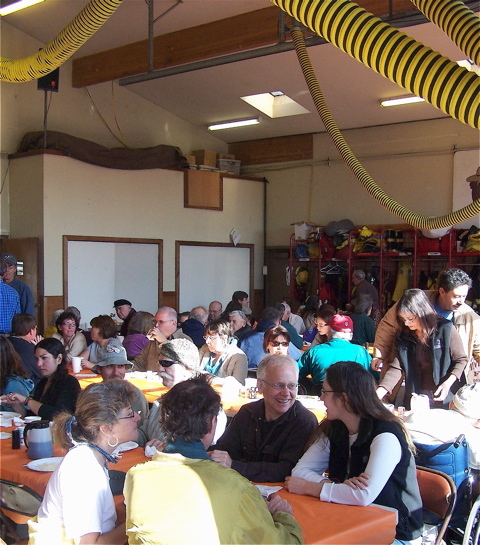 County and volunteer firefighters held a pancake breakfast in the Point Reyes Station firehouse Sunday morning to raise money for the West Marin Disaster Preparedness Council. In the foreground (from left): Donna Larkin of Inverness Park, Phillip McKee (back to camera), Tony Ragona of Point Reyes Station, and Heather Sundberg of Point Reyes Station. 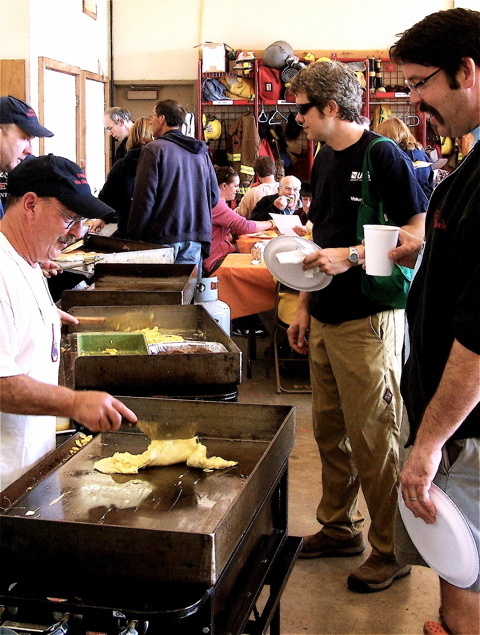 Mike Meszaros, former chief of the Inverness Volunteer Fire Department, cooks eggs in the Point Reyes Station firehouse for Matt Gallagher of Point Reyes Station during the annual event. 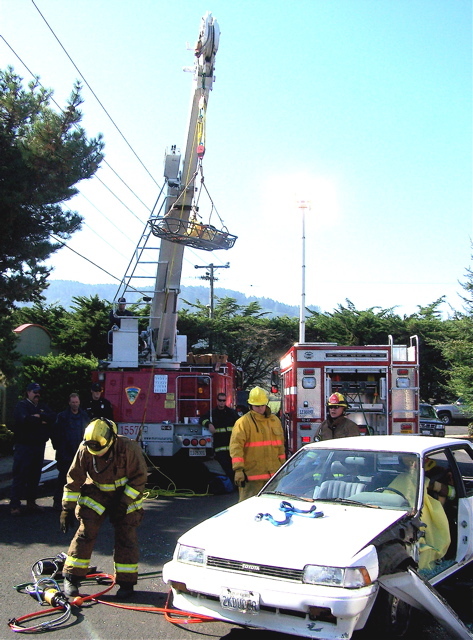 Outside the pancake breakfast, firefighters tear apart a car to demonstrate how the Jaws of Life are used to free a victim trapped in a wreck. “Jaws of Life” (a trademark of Hale Products Inc.) is not just one single tool but a set of several types of piston-rod hydraulic tools, including cutters, spreaders and rams. In the background, a rescue basket hangs from a fire engine’s hoist. While West Marin residents watched rescue demonstrations and ate pancakes at the Point Reyes Station firehouse, dozens of motorcyclists — enjoying the last Sunday of October — roared down Highway 1 a block away. This photo exhibition in progress focuses on the variety of nature that can be seen from the two acres in Point Reyes Station where I live. Here is a look at what can be seen at this time of year. 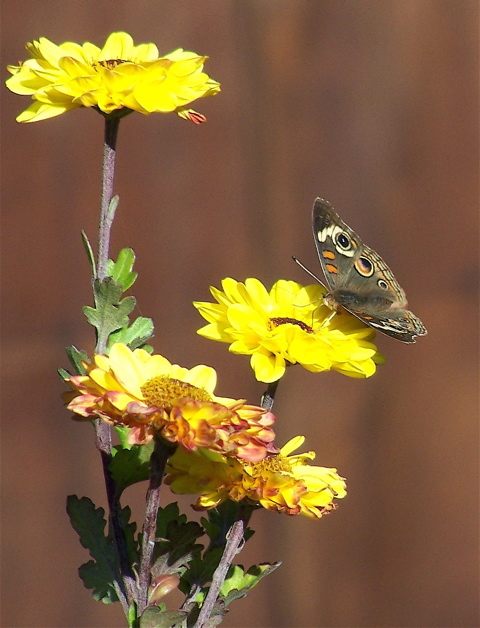 A Buckeye butterfly lands on a chrysanthemum outside my cabin Sunday. This week’s gibbous moon was waxing, and October’s full moon will be Friday night. 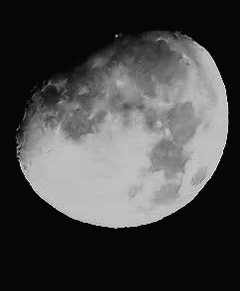 A gibbous moon is one that’s not full, but more than half its facing hemisphere is illuminated. Since childhood I have been fascinated by being able to see the moon’s topography along its terminator, the boundary between the illuminated and unilluminated hemispheres. At upper left, the dark, mile-deep crater shaped like a five-pointed star is 69-mile-wide Crater Gassendi. The light area immediately below the crater is the Mare Humorum, Moist Sea, formed by lava 3.9 billion years ago. 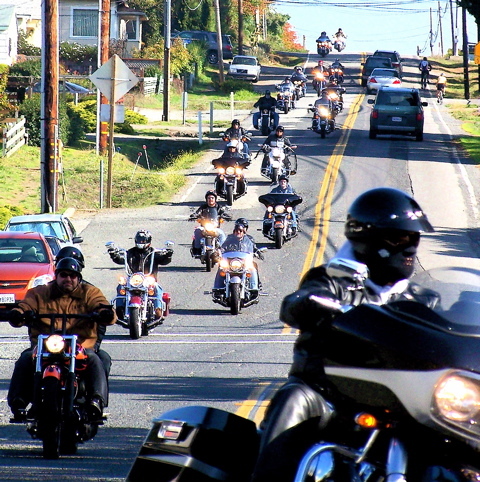 This photo, like most on my blog, was shot with a $270 Kodak EasyShare camera, which came with a 10-power zoom. Newer models cost less and have a 12-power zoom. A young blacktail buck next to my cabin just before recent rains turned grass green. A Western fence lizard suns herself outside my cabin. 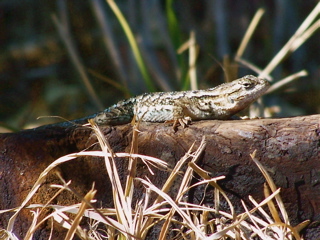 Western fence lizards eat insects and spiders, and they, in turn, are eaten by birds and snakes, which typically catch them while they’re sunning themselves. A tip of the hat this week to Rod Ruiz, supervising ranger for Marin County parks. When alerted 10 days ago to a paradox at White House Pool (no scenery visible from some scenic overlooks along Papermill Creek), he promptly fixed the problem. 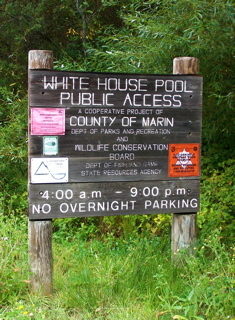 White House Pool Park is named after a wide spot in Papermill/Lagunitas Creek. Bounded by that creek to the east and Point Reyes Station’s levee road to the west, the park stretches from the Olema Creek tributary to a parking lot near the intersection of Sir Francis Drake Boulevard and Bear Valley Road. 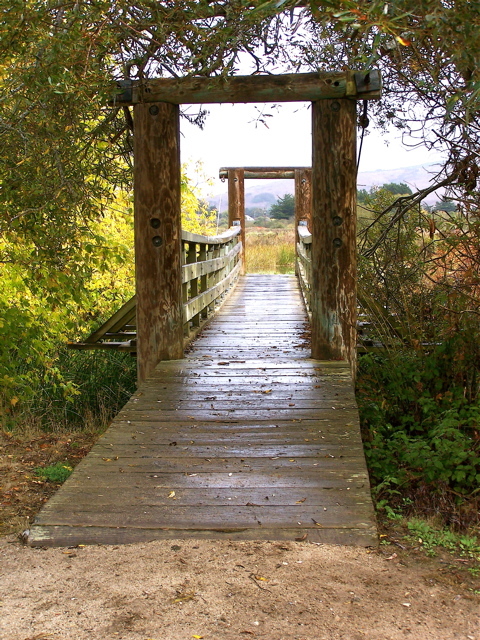 At each end is a rustic bridge. 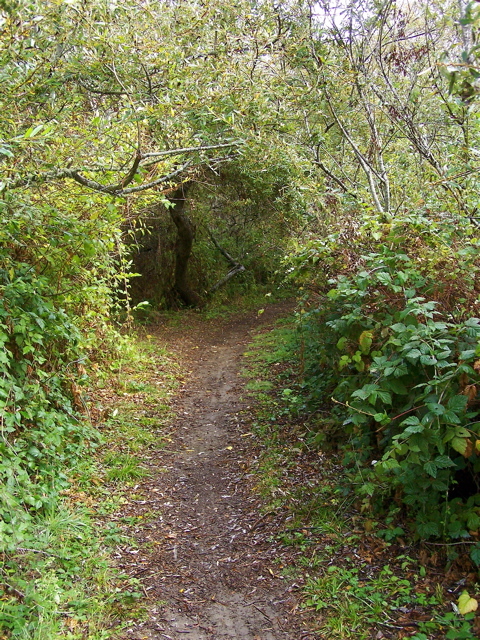 Meandering the length of the park is a storybook-like path through lush foliage, making it popular with West Marin residents from seniors out for a stroll to bicyclists to dog walkers. As can be seen at upper left, here and there along the way, county Parks and Open Space has cut narrow lanes that branch off the main path and tunnel through foliage to the edge of the levee. At the end of each lane, permanent benches overlooking Papermill Creek provide places for walkers to rest and enjoy the scenery. 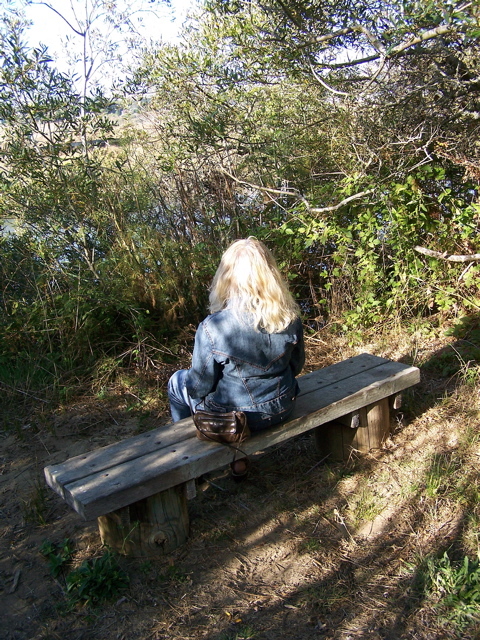 Unfortunately, in the past couple of years, foliage in front of half the benches got so high that views of the creek and the landscape beyond it were lost. Here Linda Petersen of Point Reyes Station two weeks ago tries to again spot four river otters she’d seen fishing just downstream the previous day. But from this lane and the bench at the end of it, the creek was mostly hidden. 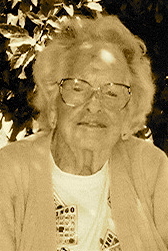 Linda was able to move to another vantage point, but her options were relatively few. 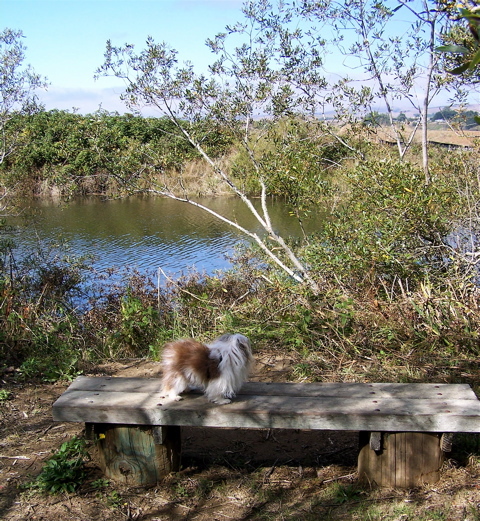 This week, Linda’s aging dog Sebastian had a much better view from the same bench. His vision needs all the help it can get, so the change was probably dramatic for him too. What had changed? Ten days ago, ranger Ruiz was told that although the benches had been been anchored where they would provide scenic views, there were no longer any views from several benches. The county was, in effect, maintaining lanes through foliage that came to dead-ends in more foliage. Ruiz said he would make sure the lanes were properly taken care of and did. It should be stressed that the county did not remove vegetation from the creek bank (i.e. riparian vegetation) but merely trimmed foliage on top of the levee. Those who enjoy looking out at the views from White House Pool can credit supervising ranger Ruiz with looking out for them. Members of the Marin County Farm on Tuesday hosted their annual V.I.P. Luncheon for local officials that work with the agricultural community. 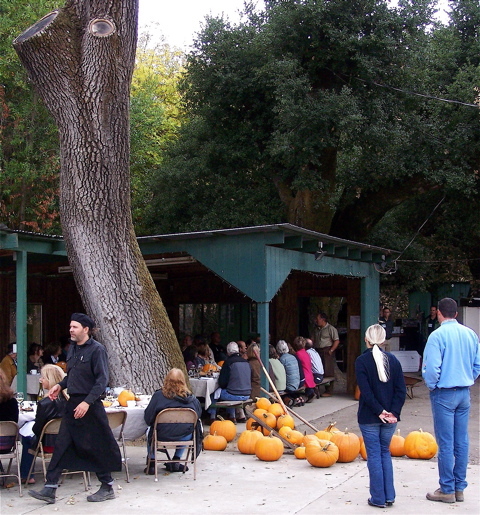 The event was held at vineyard owner Hank Corda’s deer camp off San Antonio Road. 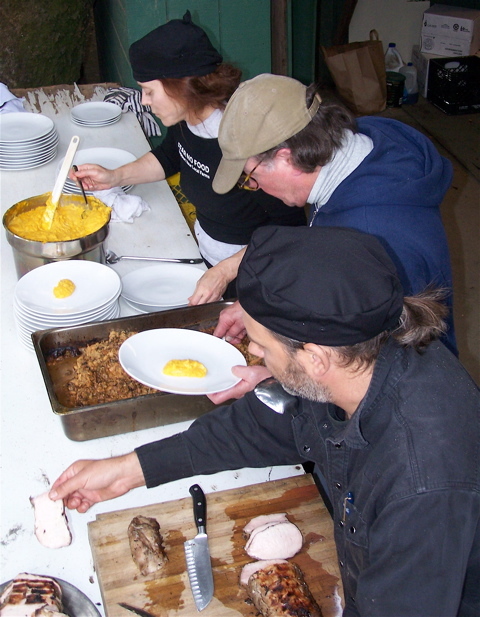 At left in black shirt and black apron is chef Daniel DeLong. Chileno Valley beef and poultry rancher Mike Gale, president of the Farm Bureau, told the guests that the elegant fare they were eating was all produced by Marin County agriculture. Sitting in front of Gale (in white shirt) is county Agricultural Commissioner Stacy Carlson. Also on hand was county Fire Chief Ken Massucco. 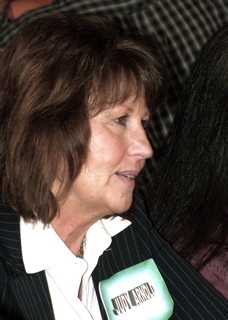 Marin County Supervisor Judy Arnold, who represents the Novato area, attended, as did Supervisor Charles McGlashan, who represents Southern Marin. Supervisor Steve Kinsey, who represents West Marin where the bulk of the county’s agricultural is located, did not attend but was represented by aide Liza Crosse. Many Farm Bureau members are unhappy with Supervisor’s Kinsey’s support for parts of a new Countywide Plan that would make provisions for establishing public trails on ranchland and would limit housing for ranch families to 4,000 square feet. 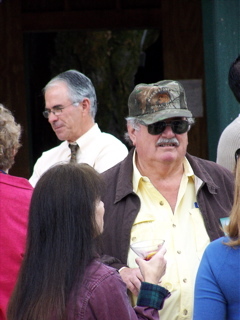 Attorney Gary Giacomini of Woodacre (in dark glasses and cap), formerly represented West Marin on the Marin County Board of Supervisors. 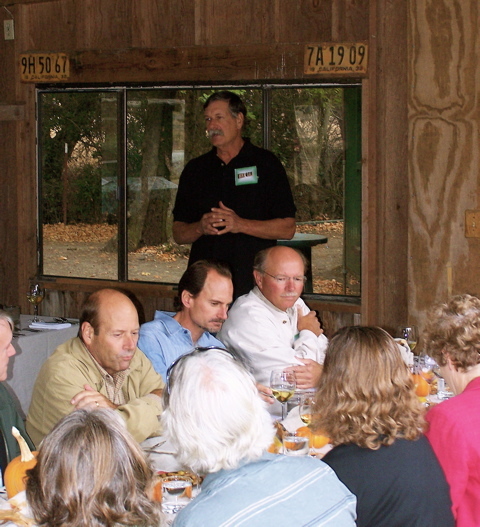 When host Hank Corda spoke to the approximately 50 people present, he praised Giacomini for protecting agriculture throughout his 24 years in office. Behind Giacomini, Marin County Sheriff Bob Doyle listens to a story. 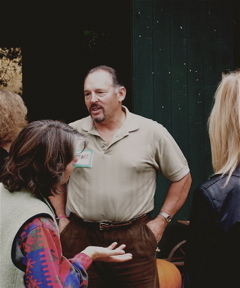 Vineyard owner Hank Corda (at right) chatting with guests at his deer camp. 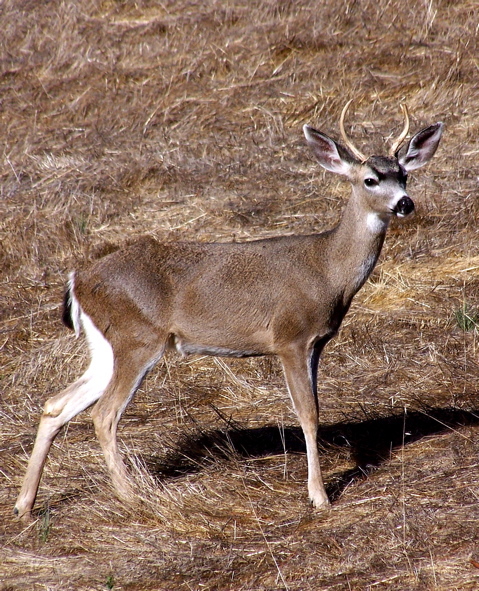 The Corda family has owned the ranchland where the deer camp is located since 1936, he said. 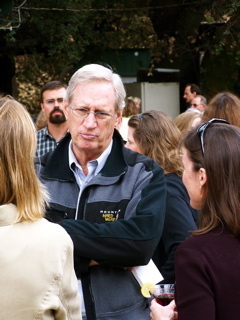 Bob Berner, executive director of Marin Agricultural Land Trust (at right), was one of several guests representing nonprofits ranging from the Marin Farmers Market to the Marin Humane Society. Margaret Grade and Daniel DeLong (left and right) of Manka’s restaurant catered the V.I.P. Luncheon with help from chef Denis Bold. The fare ran a gourmet gamut from goat-burger appetizers (from Evans goats on Point Reyes) to pork loin (from Bagley-Cunninghame hogs in Tomales) to apple pastry with whipped cream (from Gale apples in Chileno Valley). A storm-caused fire severely damaged Manka’s Inverness Lodge and Restaurant Dec. 27, but Grade said she hopes to reopen next year. 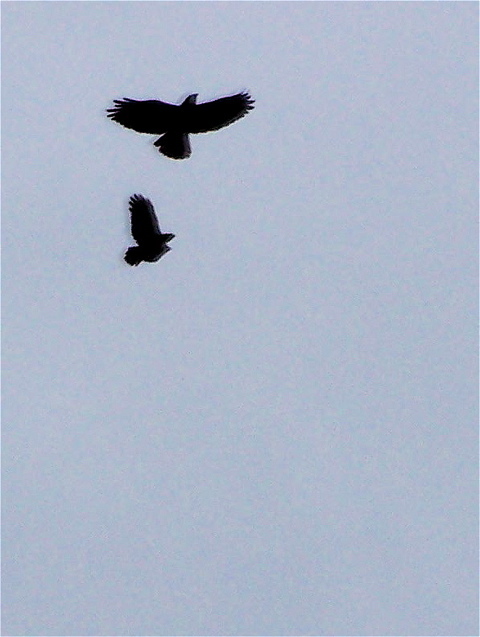 Two red-tailed hawks above my cabin, part of a family group of four. Biologist Jules Evans of Point Reyes Station notes this time of year is also the height of the coast’s hawk migration, which can best be seen at Hawk Hill on the Marin Headlands. For those who haven’t been there before, here are directions. While southbound on Highway 101, take the last Sausalito exit before the Golden Gate Bridge, turn left a short distance, and then turn right onto Conzelman Road. Go a ways and then watch for the sign for Hawk Hill. 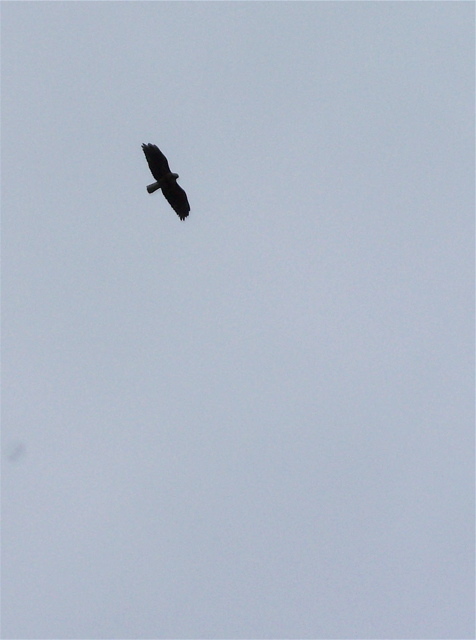 Although this is the height of the hawk migration, which includes red-tailed and red-shouldered hawks along with falcons and turkey vultures, the migration can be seen throughout the fall at Hawk Hill. The hill is so named because migrating hawks, falcons, and vultures reconnoiter above it before crossing the Golden Gate, which is why so many hawks can be seen circling there. Biologist Evans notes that not all members of these species are migratory. 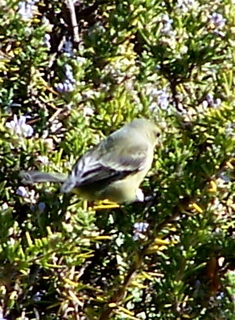 Some are year-round residents of West Marin. 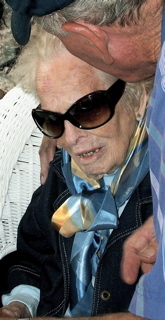 More than 80 guests showed up Sunday at Leroy Martinelli’s deer camp in Tomasini Canyon to celebrate his mother Hazel Martinelli’s 101st birthday. 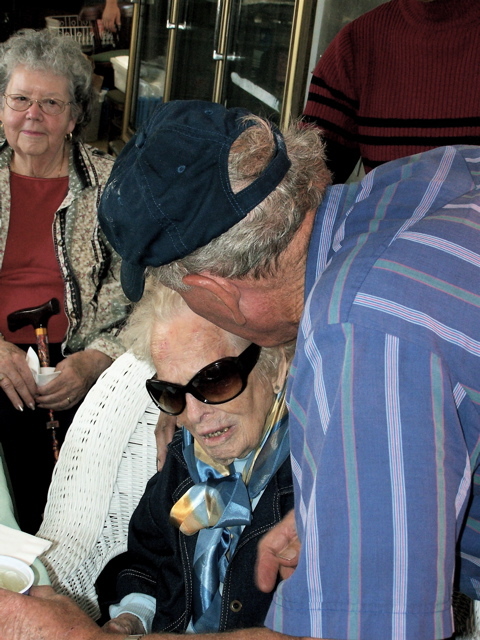 Mrs. Martinelli, who lives with her daughter Patricia in Point Reyes Station, is seen here with her son Leroy at right and Joan Haley of Point Reyes Station at left. 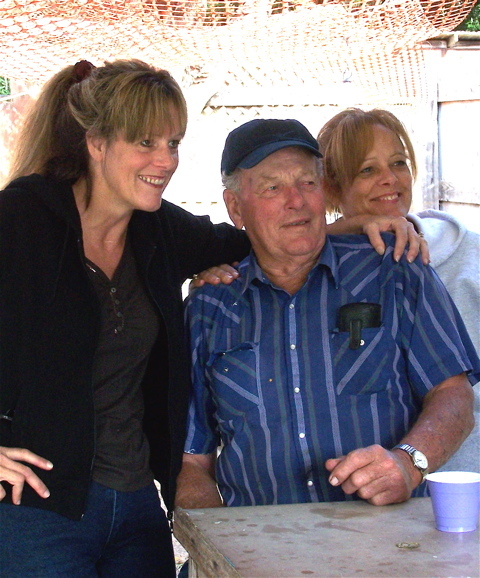 Leroy Martinelli, himself 78, with daughters Gail Hale and Margie Langdon during the party he hosted at his deer camp. Such hunting “camps” are common on ranches around Point Reyes Station and typically consist of a small clubhouse with a kitchen and social area. Guests arriving for Sunday’s party found part of the entrance road patrolled by black Angus steers. 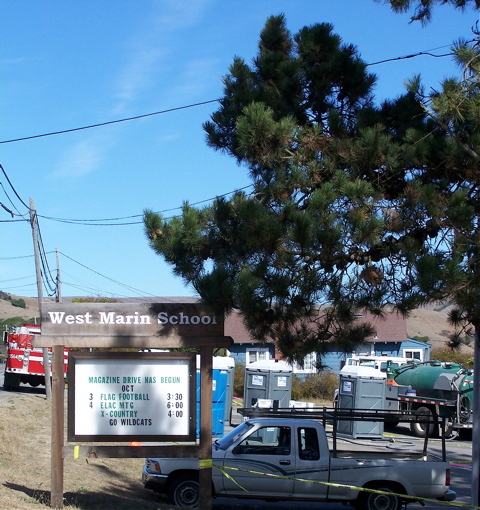 Vandals in the early hours Sunday pushed over 11 portable toilets that had been set up in the parking lot of West Marin School for a lunch stop on the Waves to Wine Bike Tour. The tour, which passed through Point Reyes Station Saturday, was a fundraiser for the National Multiple Sclerosis Society. Each of the toilet stalls holds 30 gallons of sewage and chemicals. 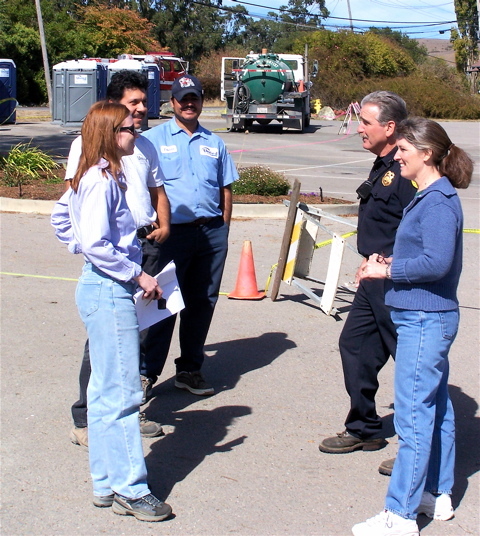 West Marin School Principal Anne Harris (right) and firefighter Joe Morena on Sunday worked out cleanup plans with Jennifer Snow of Marin County Environmental Health Services and crew from the portable-toilet company. The group decided against hosing off the sloped parking lot because that would send contaminated water into the school’s storm drain and potentially into Papermill Creek. Instead, the group decided to wet vacuum the area and disinfect it with bleach. Sparsely Sage and Timely is powered by	WordPress 4.9.10 and delivered to you in 0.372 seconds using 39 queries.